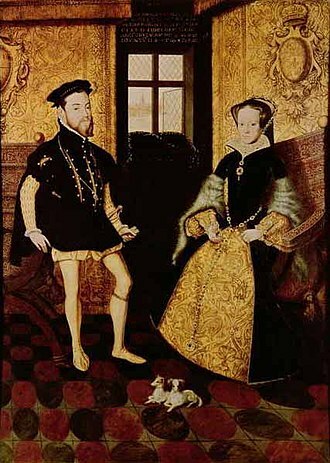 On July 25 of 1554 English queen Mary I married Philip II of Spain. It wasn’t just a bad plan. It was a bad plan with legs. Mary is of course “Bloody Mary,” infamous for her efforts to restore Catholicism in England and the first link in an apparently strong chain connecting Catholicism with tyranny outside England and threats to English security and freedom. To Catholics this association is not merely a mistake. It is an infamous calumny. And I have some sympathy with their position. But let me first state the case for the prosecution. Looking at European history it can be difficult to think of a nation that successfully combined Catholicism with political liberty. Certainly neither France nor Spain did so. Indeed they didn’t make much of an effort, becoming instead geopolitical threats to England and its unique system. Ultimately, as Daniel Hannan notes in his superb Inventing Freedom, the Anglosphere developed a powerful self-understanding as free and Protestant in which the two were intimately connected. But of course that brings us to the one major nation that did combine Catholicism and freedom. England. Yes, England. It can be hard to recall given the powerful English-speaking identification of political liberty with Protestantism from the 17th through the late 19th century. But the England of Alfred the Great, of Magna Carta and of the development of effective Parliamentary institutions and control of the power of the purse was entirely and uncontroversially Catholic. It was also very resistant to any effort by the Pope to meddle in its affairs. The writ of Praemunire loomed over anyone who attempted to suggest that the pontiff could dictate political matters and kings and parliaments alike were resolute in rebuffing any such initiative. But for all that they were also staunchly Catholic right down to that determined “Defender of the Faith” Henry VIII, awarded that title by the Pope for his defence of the sacraments in particular against Martin Luther. Henry’s conduct was deplorable and also in a very important way unlawful. In dissolving the monasteries he was obliged to return their lands and other assets to those who had donated them, not bag them for himself. (It also did a great deal of damage to the private welfare system on which many of England’s poor depended, but that’s a topic for another day.) And under Henry and subsequent monarchs other than “Bloody Mary,” Catholics were subjected to violent persecution that intruded on matters of conscience and seem to me especially obnoxious because people were deprived of property, liberty and sometimes life itself not for challenging the established order but for upholding the faith that had been central to English life since the seventh century and which showed no sign whatsoever of being incompatible with or indeed in any way detrimental to the unique English flourishing of political liberty. Had Richard III won at Bosworth field, had the Tudor usurpers never come to power, there is no reason to suppose that Parliament would suddenly have been crushed, Magna Carta repealed or liberty in any other way threatened. Indeed, by any rational measure Henry VIII was as dangerous to liberty as anyone since Bad King John. Certainly one thing that has dismayed me at various sites in England is the way Henry’s thugs reduced ancient establishments to ruins including at Winchester where the bones of many Anglo-Saxon kings had lain undisturbed for six or more centuries. It seems impious, even if you disagree with the specific doctrines, thus to vandalize marks of man’s search for the transcendent. For all that, the odd thing is that Henry’s actions did not destroy liberty. They did violate it for Catholics, which remained a problem in England for many hundreds of years. But there’s an important complicating factor. From the sixteenth century on, the most serious threats to English national security and political system did arise from Catholic monarchs. Some were foreign, like Louis XIV. But some were domestic, including Charles I and James II, to say nothing of Guy Fawkes. And then there was Mary’s extraordinary decision to marry Philip of Spain, he of the Armada, in what was surely intended in her husband’s mind to be an unequal partnership personally and politically, with Spain and its king dominant. If Catholicism was not inimical to political liberty, its more powerful adherents did very little to make this truth evident. There is a great deal more to this story than one marriage. And if Mary was “Bloody” for her treatment of Protestants, what of various other Tudors’ martyring of Catholics? But Mary’s decision certainly put restoration of Catholicism under a dark cloud of suspicion at the very outset, a cloud from which that faith and English Catholics did not really emerge until the 20th century, in part because threats to freedom by that point were coming from very different sources, from the Protestant Prussia-dominated Germany Empire to neo-pagan Naziism to atheist Bolshevism.